Tormentil, Potentilla erecta, also has the synonym Potentilla tormentilla. The roots are very high in tannins. A tea made from the fresh root is a remedy for diarrhoea. Approved by German Commission E as a remedy for diarrhoea and sore throats. The roots are also the source of a red dye and are traditionally used as a tanning agent for leather. 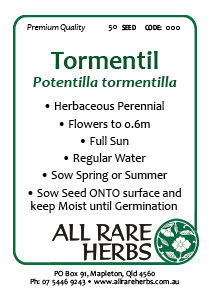 Tormentil is a native of the UK and Europe and prefers light, well drained soils in an open, sunny position. Bright yellow, four-petaled flowers in summer and autumn. Frost resistant but drought tender. A perennial plant, growing to 0.4m x 0.5m. Be the first to review “Tormentil, seed” Click here to cancel reply.